For the adventurous, try an inflatable or sit-on-top kayak tour. Discover the freedom and challenge of the river kayaking in Montana. Experience not required. All kayak tours begin with paddling instruction. Hellgate Canyon Scenic Tour – begins above Missoula, travels through Hellgate Canyon and ends in the heart of Missoula. You will most likely see eagles, osprey, deer and other wildlife. Available April through September. Departs at 9 am or 5 pm. 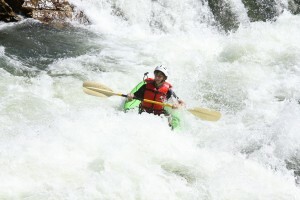 $90 per person, includes gear and a kayak instructor (4 person minimum). 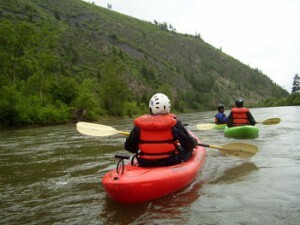 Scenic Half-Day Missoula Kayaking Tour – Lower Alberton Gorge – travels through the Alberton Gorge section of the Clark Fork River. The Alberton Gorge, created by Glacial Lake Missoula, is isolated from roads, has magnificent rock formations and dramatic rose-colored cliffs rising vertically on both sides of the river. You will likely see lots of birds, including osprey, mergansers, eagles, king fishers and hawks. We may also see deer, bear, moose or elk. History Buffs? All of our guides are well-versed in the history and geological features of the area. Daily departures available May through September. Tour ends with appetizers and beverages. 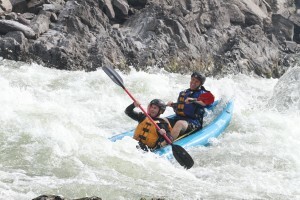 $120 per person, includes gear and Missoula kayaking instructor (2 person minimum). Scenic Half Day Tour – Blackfoot River – the river that Norman Maclean wrote about in A River Runs Through It. “I am haunted by waters,” Maclean says. See for yourself the beauty of this river and its landscapes. You too will be enchanted by your memories of its wildlife, mountain views and fun stretches of gentle water with clear deep pools for swimming. Available May through June. Tour ends with appetizers and beverages. $120 per person, includes gear and Missoukayak instructor (3 person minimum). Looking for more excitement?! Our sit on top whitewater kayak tours through the Alberton Gorge offer beautiful scenery through long pools of flat water mixed in with fun class II & III rapids for excitement. Half Day Tour – includes appetizers and beverages. $120 per person, includes gear and kayak instructor (2 person minimum). Paddling experience helpful. Full Day Tour – includes lunch served riverside. Departs at 9 am and returns between 2 pm – 4 pm. $160 per person, includes gear and kayak instructor (2 person minimum). Paddling experience required. Day One: Meet in Missoula at 9 am. You will receive your own dry bag to pack your things and obtain any other camping gear you might need. We transport you to the river access where we have lunch riverside before a safety talk and then departure. Paddling down the Blackfoot River, stopping periodically to enjoy the scenery, rest and have a bite to eat. The first day you will travel 14 miles down the Blackfoot River before stopping at your campsite. You can help your guide set up camp along the river’s edge, or just change clothes and relax as your guides prepare dinner. 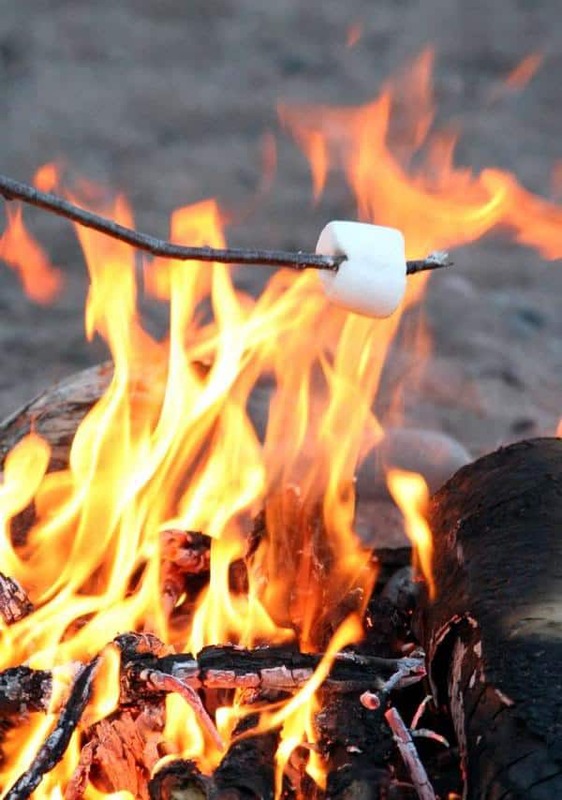 There are plenty of tales to tell around the campfire. Day Two: Wake up to a hot cooked breakfast and fresh coffee! Once everyone is packed and ready to depart, you will travel another 9 miles along the beautiful Blackfoot River before finishing up near Bonner, Montana. Meals provided: Lunch, dinner, breakfast, lunch, and snacks. Finishing Time: 2 pm – 3 pm. What to bring: Your clothes, swimsuits, fast drying clothes, sunscreen, sunglasses and straps, hats with straps, lotion, sandals or tennis shoes you don’t mind getting wet.